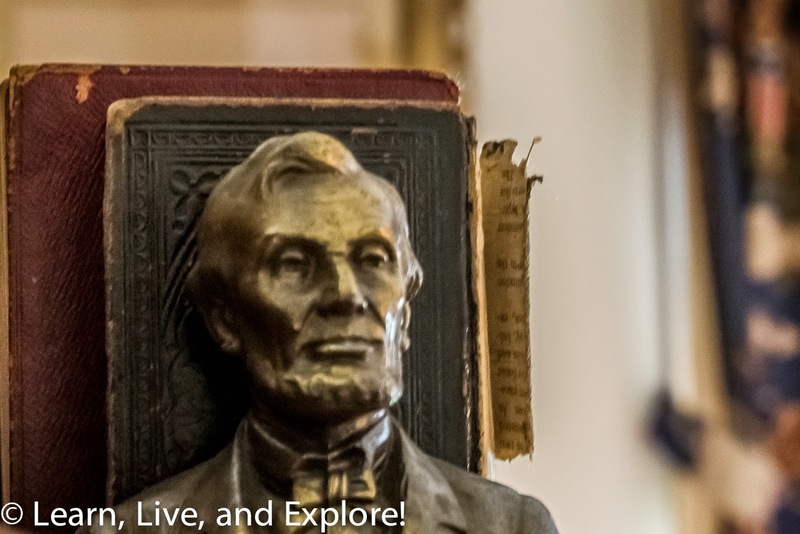 150th Anniversary of the Lincoln Assassination ~ Learn, Live, and Explore! These past few weeks, as the history nerd that I am, I've been following the commemoration of the sesquicentennial anniversary of the assassination of President Abraham Lincoln on the night of April 14, 1965. The Civil War had finally come to an end, five days earlier on April 9, with the Southern surrender by General Lee to Union General Grant at Appomattox Court House in Virginia. In the days leading up to the assassination, Lincoln addressed the crowds celebrating in Lafayette Park from a window on the 2nd floor of the White House, speaking of his post-war plans for the country. Meanwhile, John Wilkes Booth, a popular actor in Washington (an 1865 equivalent of George Clooney) and a very strong Confederate supporter, escalated plans of his own. Booth and his co-conspirator thugs had attempted to kidnap the President prior to the end of the war, in the fall of 1864, in order to hold him ransom for the release of Confederate prisoners of war. When his plans fell through, Booth was frustrated and more determined to take action. On the morning of April 14th, President Lincoln decided he wanted to go to the theater to relax after all the stress of the previous days. Originally, it was thought that they would go see Aladdin at Grover's National Theatre, now the National Theatre, on Pennsylvania Avenue in Washington D.C. In the end, the first couple fatefully decided to see "Our American Cousin" at Ford's Theatre, while their youngest son, Tad, went to Aladdin. Robert Todd Lincoln, the President's oldest son, opted to not join his parents because he was tired from riding from Appomattox, where he witnessed the surrender and rode hard home because he wanted to share, first hand, the news to his father. He would later regret his decision not to attend. Originally, the Lincolns had invited Ulysses S. Grant and his wife to the performance, but Julia Grant was not fond of Mary Todd Lincoln and the couple wanted to travel that day to New Jersey to be with their family members now that the war was over. After exhausting a list of people, the couple who joined the Lincolns that night were Major Henry Rathbone and his fiancée, Clara Harris. The home where Rathbone lived is right off Lafayette Park, the shutterless brick townhome below. Meanwhile, John Wilkes Booth heard of the President's intentions for attending a play that evening, and immediately started snooping around his theater contacts to get the scoop on which play. He then engaged his co-conspirators in a three pronged attack to "cut of the head of government." This murder plot included the deaths of Lincoln, Vice President Andrew Johnson, and Secretary of State William Seward. It's rumored that he also tried to kill Ulysses S. Grant while in route to New Jersey, when he heard of the General's travel plans, but was not able to gain access to their train car because it was guarded. It is possible that another of Booth's accomplices, Michael O'Laughlen, was the one tailing the Grants, as he resembles Booth. It seems unlikely to me that a man could do so much in so little time, so the latter theory is more plausible. Here's where I will pause on the history dump and talk about the great walking tour I took specific to the Lincoln Assassination. 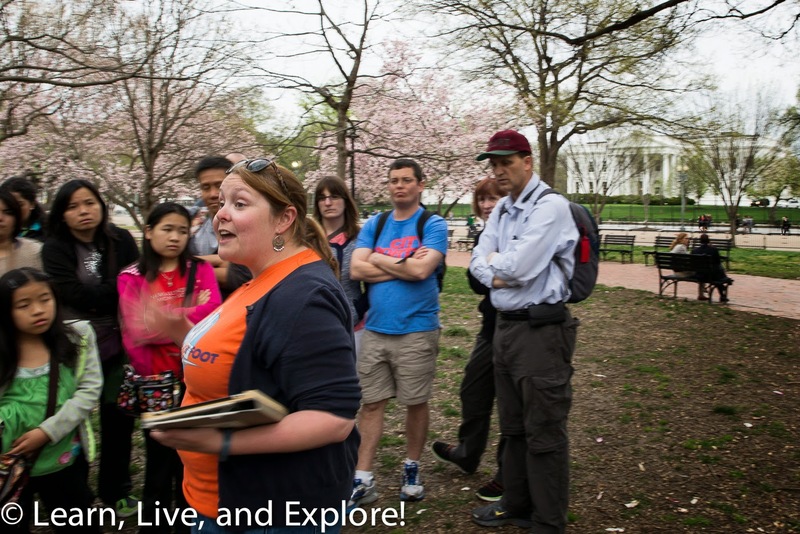 The tour is offered by Free Tours by Foot, and is a pay what you like tour - meaning the guides work on tips only. 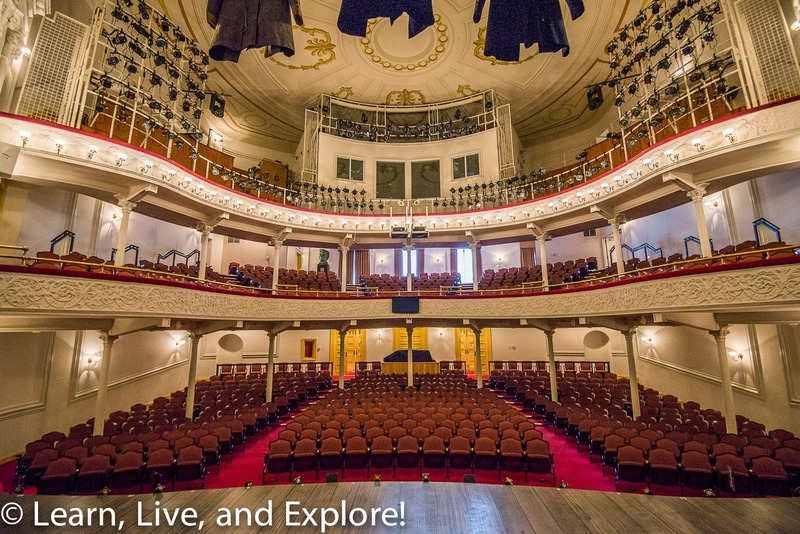 For reference, Ford's Theatre also offers a guided walking tour. Becca, our guide, was both passionate and knowledgable. 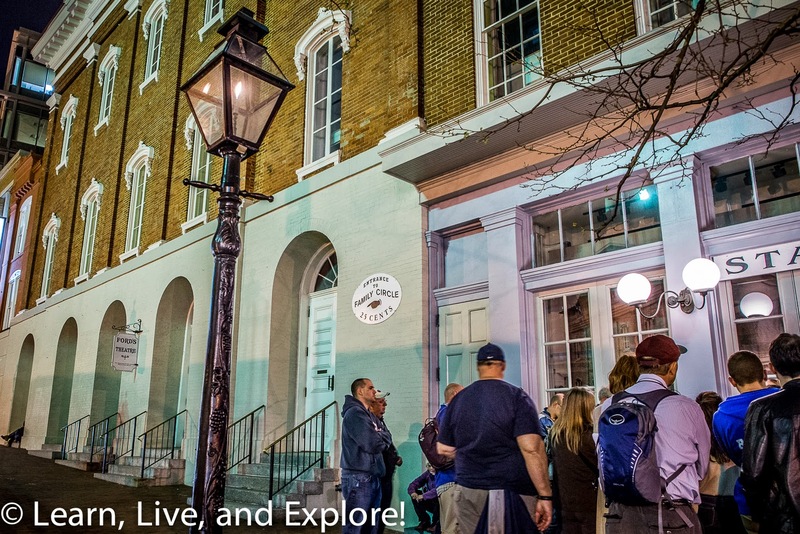 The tour lasts approximately two hours and covers the locations of Lafayette Park, Seward's House (a brick mansion that was located on the site of the National Courts Building), Grover's National Theatre, the site of the Kirkwood Hotel where Johnson was staying, and Ford's Theatre. Becca talked us through the unsuccessful murder of Seward, who had been in a carriage accident just nine days prior to April 14th and was being treated in his home. Booth assigned Louis Powell (also went by Payne), a former Confederate soldier and an all around mean guy, to kill Seward. David Herold was left minding the horses in Lafayette Park while Powell entered Seward's house with a bluff of delivering medicine. Powell, after getting past the butler, encountered Seward's son and both stabbed and pistol-whipped him. 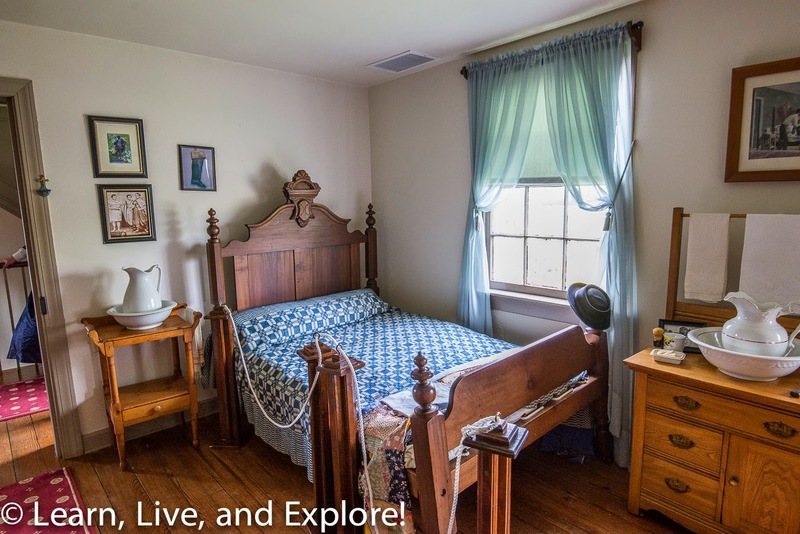 Seward's daughter, who was nursing her father, opened the door to tell her brother to be quiet and, thus, disclosed her father's room to the intruder. 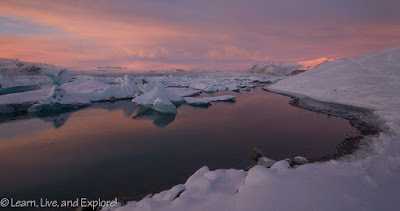 Powell entered the room, and started to stab Seward with his bowie knife only to encounter difficulties because Seward had a brace around his neck to help heal his broken jaw. Despite multiple stab wounds, Seward lived through the attempt. Powell got nervous knowing the butler was sounding the alarm in the park and began his escape, stabbing two others in the room, plus Seward's daughter and a final victim on his way out. When he got to his horse, David Herold had left along with the escape route plan. Powell was not familiar with Washington D.C. and proceeded to wander the city for three days before showing up to the Surratt Boarding House late at night where the police happened to be searching for evidence of John Surratt's involvement in the assassination. The bloody clothes and weak excuse for his presence late at night gave the police a reason to arrest Powell, and later Seward's butler identified him as the attacker. Next, the attempt on the Vice President's life was assigned to George Atzerodt. This is a short story because Atzerodt was an unwilling participant. Booth had coerced him into joining the plan by signing a letter on his behalf describing the plot and the reasoning behind the murders that Booth had thought had been mailed to the National Intelligencer by a theater colleague. It never was mailed. Thinking he was implicated, Atzerodt showed up at the Kirkwood Hotel, formerly located on the corner of 12th and Pennsylvania, and proceeded to get drunk and leave having never seen Johnson. Meanwhile, Booth was putting his plan into motion at Ford's Theatre. After a few drinks for courage at the Star Saloon next to Ford's Theatre, Booth made his way into the very crowded play. About 1700 people were in attendance, more than double normal capacity, because people had heard the President, and even better General Grant, was going to see the play. Booth was noticed as he made his way across the back of the balcony section. (Photo below: Booth traveled from right to left) People were excited to see him and recognized him because, as I mentioned earlier, he was like a George Clooney or a Tom Cruise in the town. Making his way to the box anteroom, where the guard had surprisingly left his post, Booth handed his card to the usher and gained admittance. He jammed the door from the inside and proceeded to pull out his Derringer pistol in one hand and knife in the other. 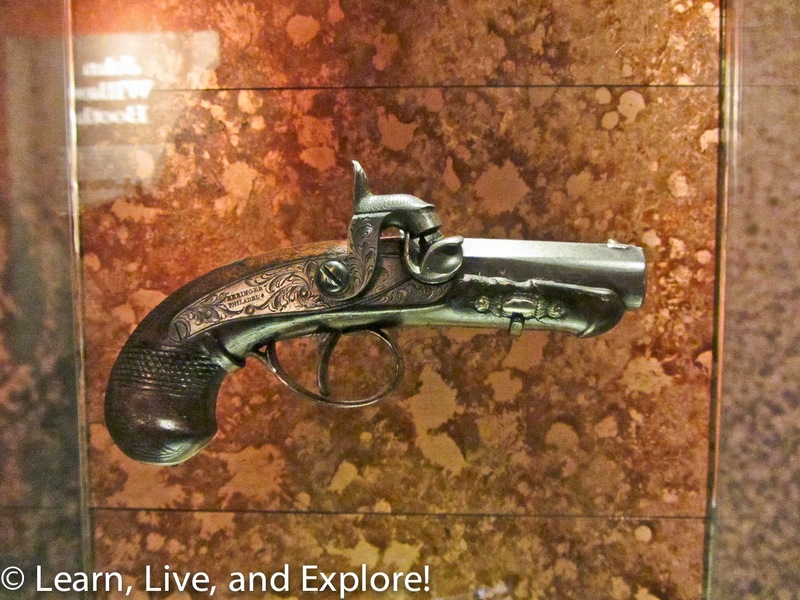 This pistol, the knife, the inner door in which booth had carved a peep hole earlier, the wooden stick used to jam the door, Lincoln's dress coat from that night, and a chair from the theater box are all in the Ford's Theatre Museum. 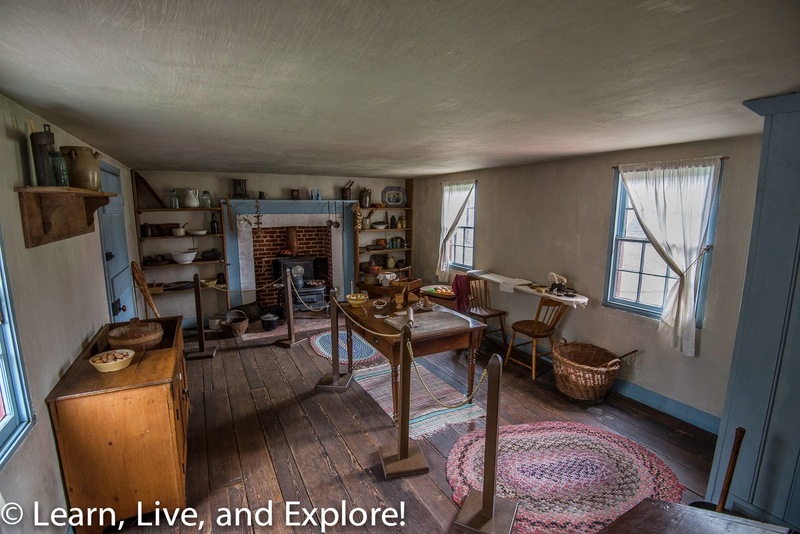 The museum also contains Booth's diary of the escape and compass, the flag on which Booth caught his spur, and the portrait of George Washington from the box. At the exact moment Booth knew a line in the play would be said and met with intense laughter, Booth entered the box and shot the President in the back of the head. Lincoln immediately lost consciousness. Mary Lincoln and Clara Harris began to scream and Major Rathbone tried to capture Booth, but received a deep knife wound from shoulder to elbow from the effort. 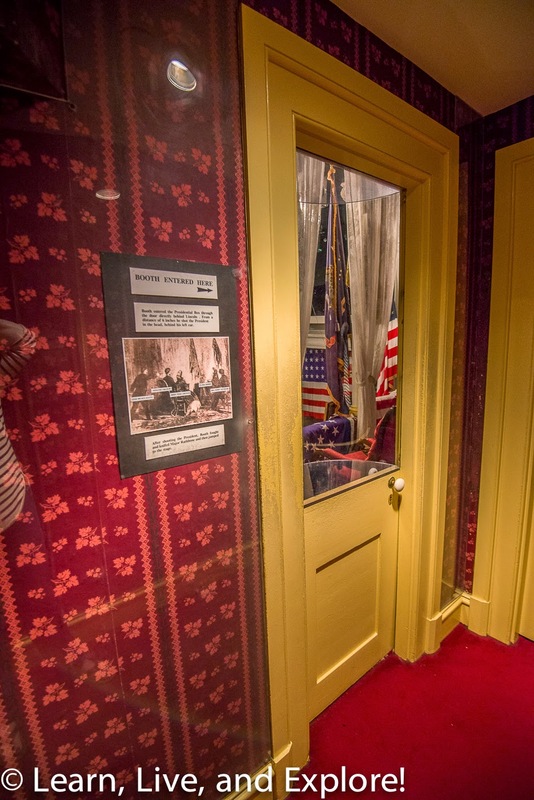 Booth went over the side of the balcony and jumped the 12 feet to the stage, but his spur caught on the U.S. Treasury Guards flag draped from the box. It is believed this is when he broke his leg. It didn't stop him from getting up, waving the bloody knife, shouting something widely believed to be "Sic semper tyrannis," and running out the stage door to his waiting horse. 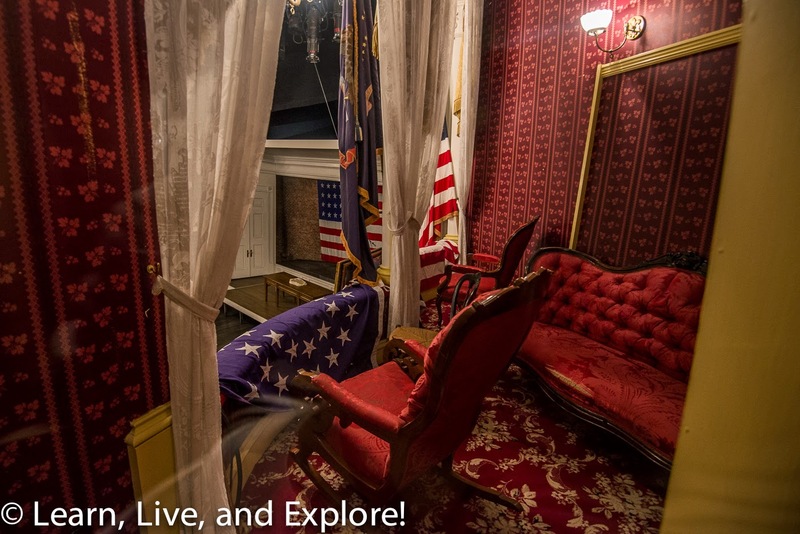 All of the photos of the interior of Ford's Theatre came from a private small group tour I took. 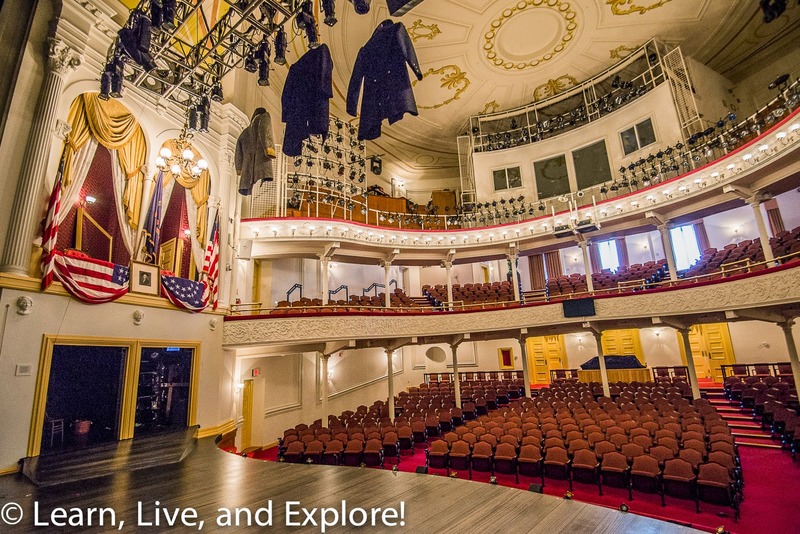 I am not clear if the tour was part of the 150th commemoration or if they are offered regularly, but looking at the Ford's Theatre website, it looks like there are sporadic tours available on an updated calendar. 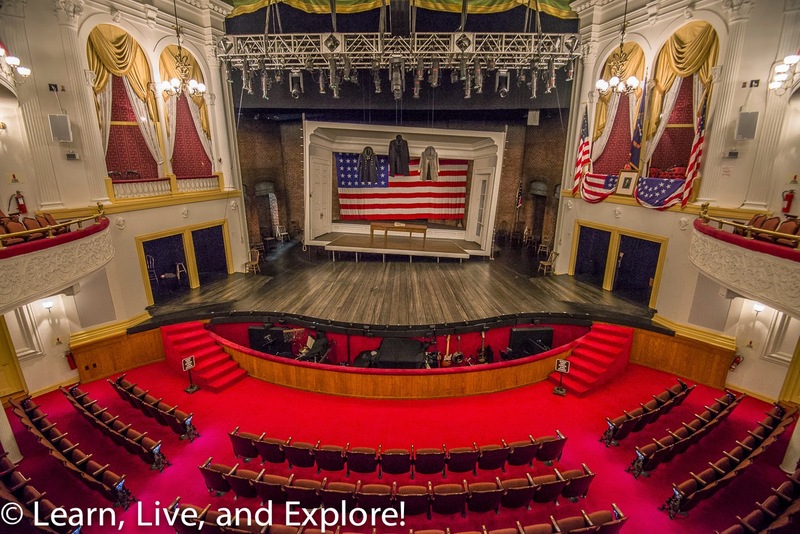 The timed entry admission to Ford's Theatre, the Lincoln Museum, Petersen House, and the Lincoln Education Center are all free (or available for advance reservation for a small fee) through NPS and/or Ticketmaster. Especially during the busy tourist season, I would strongly advise advance tickets. 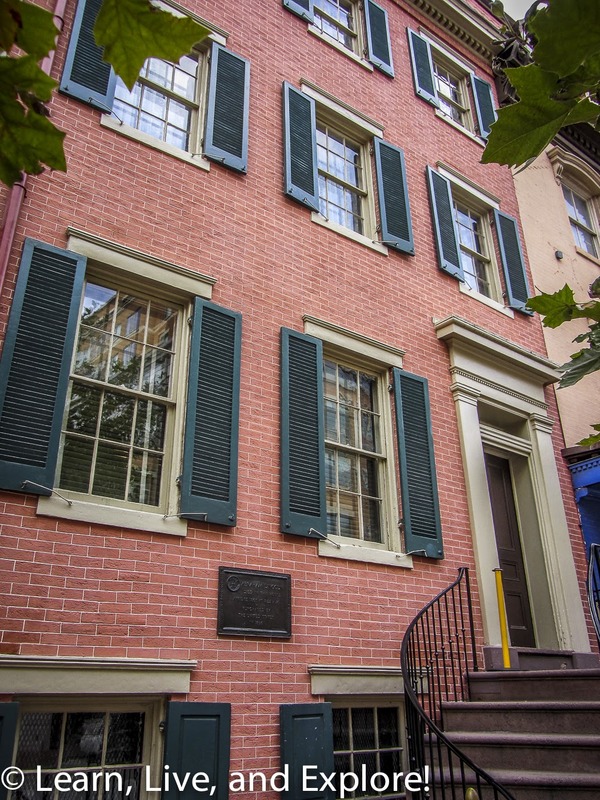 The Petersen House across the street from Ford's Theatre is where the President was taken after first being treated in the theater by a Union doctor in attendance. The President was placed diagonally on a bed in the back room in order to accommodate his height. 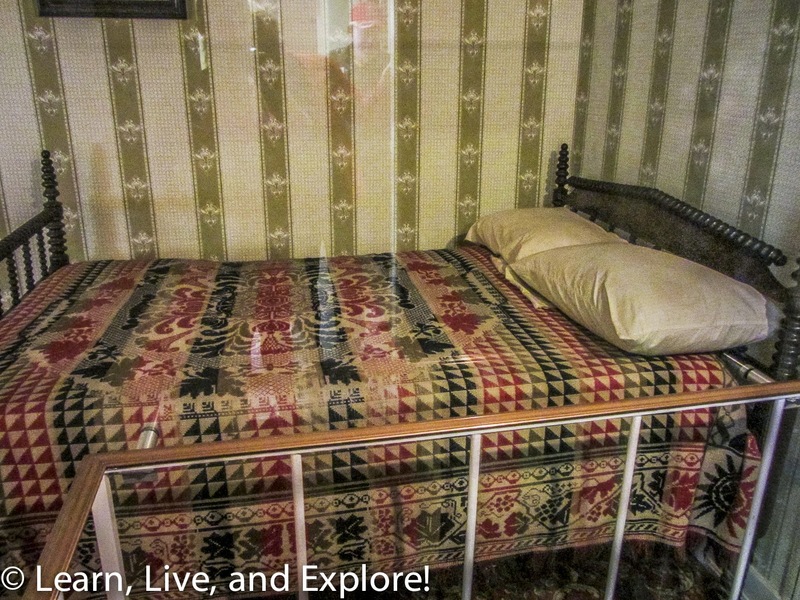 The actual bed where Lincoln died is surprisingly located in Illinois at the Chicago History Museum. When the Petersens died, their furniture was auctioned off, including the infamous bed which sold for $80 to William Boyd. Boyd's son inherited the bed and proceeded to sell it to Charles Gunther, a Chicago candy maker. The Chicago History Museum purchased the furniture set in 1920. 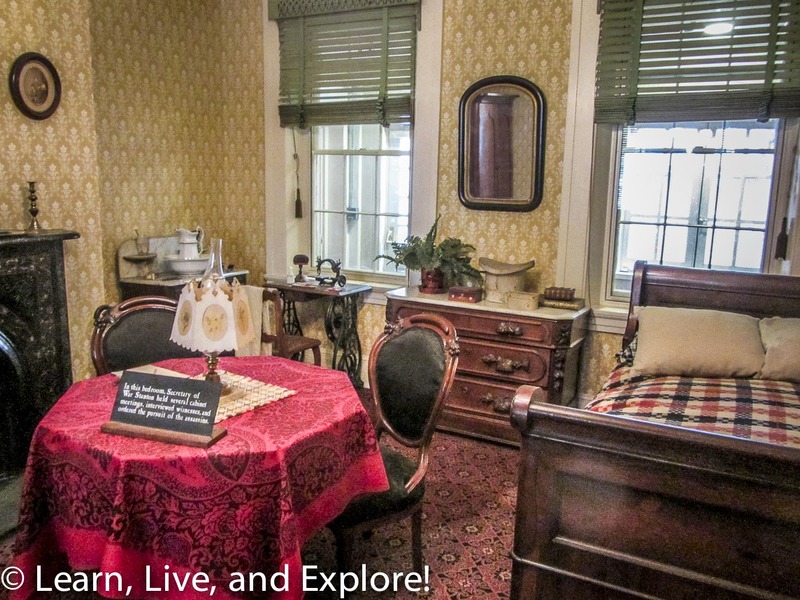 When not waiting at the President's bedside for his inevitable death hours later the morning of April 15, Mary Lincoln, with her son Robert, and Secretary of War Stanton made use of the Petersen's parlor and another bedroom. 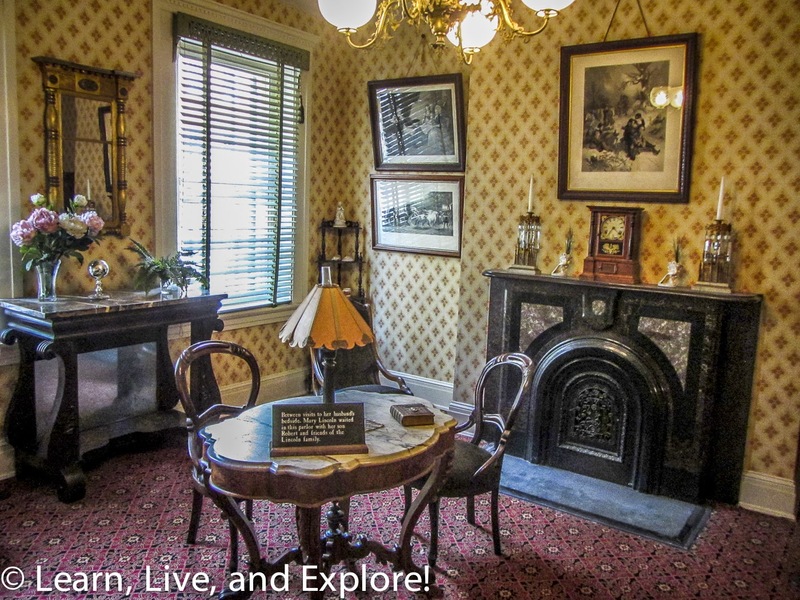 Next door to the Petersen House is a Lincoln Educational Center that has permanent and temporary exhibits. Obviously, the focus now is on the anniversary and the events leading up to and immediately proceeding Lincoln's death. 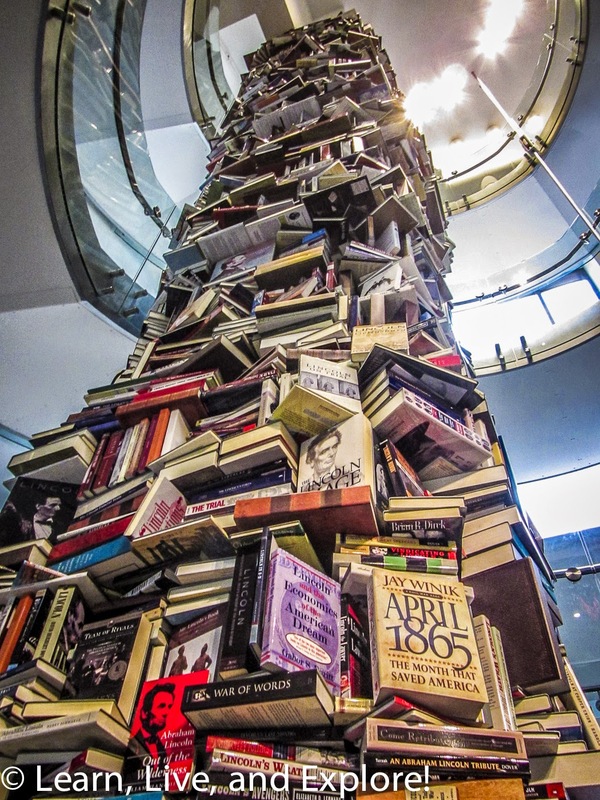 They have a great art piece that is a tower of all of the books that have been written about the assassination. Currently it stands at 34 feet comprised of about 6,800 books, and I do not know if there are plans to add to that number and height. Though I didn't specifically visit this other Washington D.C. Lincoln Assassination site this month, I have mentioned it in a prior post of hidden D.C. history treasures. 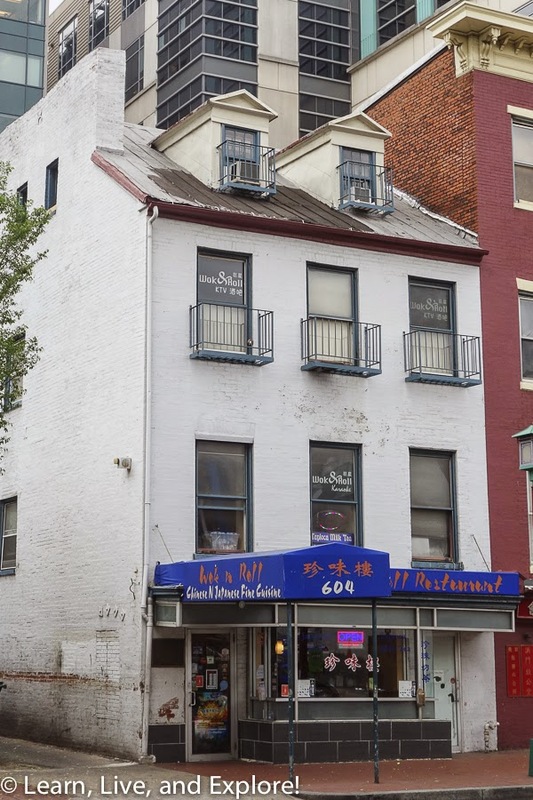 That site is Mary Surratt's Boarding House, located on H Street between 6th and 7th, which is now a Chinese karaoke restaurant called Wok 'n' Roll. My final Lincoln Assassination adventure this month included two stops on John Wilkes Booth's escape route. 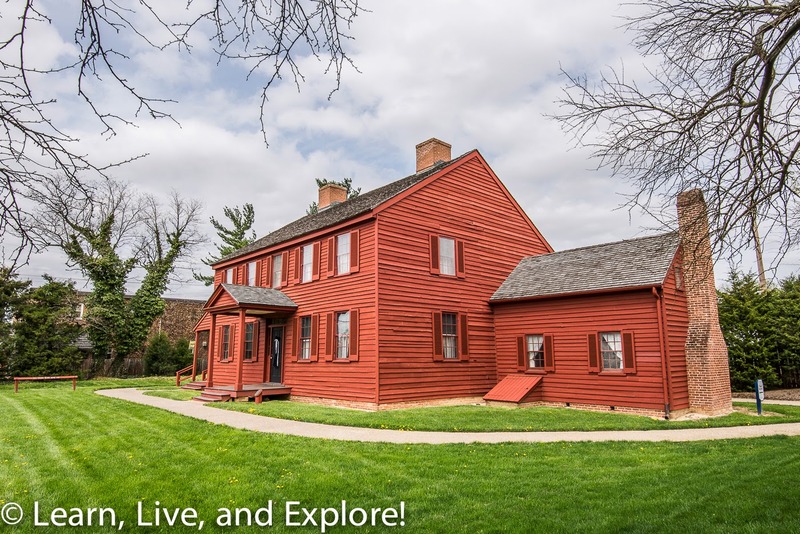 The first is the Surratt House and Tavern, located in Clinton, Maryland. Mary Surratt lived in this house with her husband until his death in 1862. The left wing of the building included a small tavern and post office combination. The Surratts also offered boarding services to travelers. 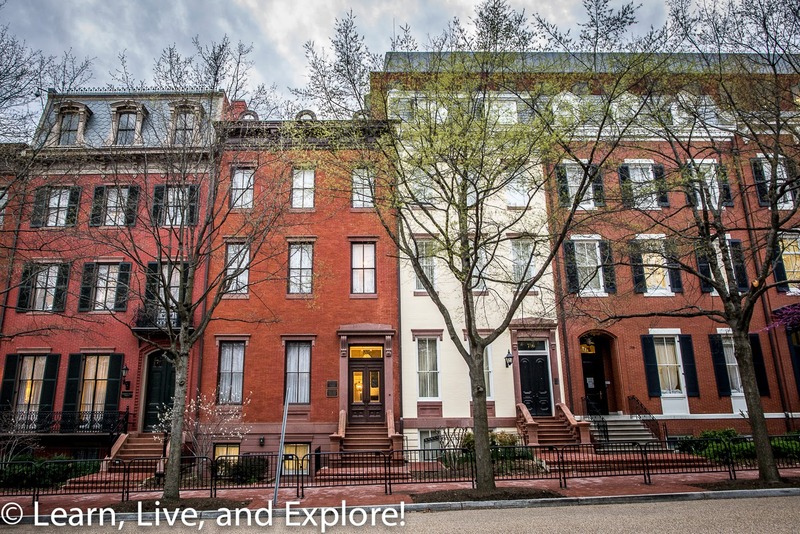 By 1864, the remaining Surratts could no longer maintain the property, and it was rented out while Mary moved into the city with her daughter to manage their H Street property as a boarding house. John Surratt, a Confederate courier, used his position to spy on the Union, and it was this that attracted Booth to him when Dr. Samuel Mudd first introduced them. For the assassination plot, Mary Surratt was accused of assisting the conspirators not only because they used her boarding house as a meeting place but she allegedly made sure that weapons and supplies were waiting for Booth at the tavern on his escape route. 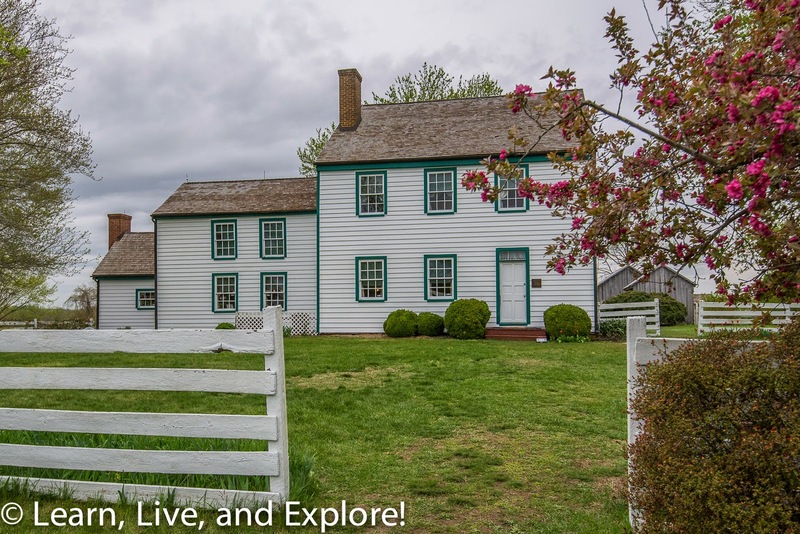 A short drive south from Surratt House is the home of Dr. Samuel Mudd. Mudd is recognized as the man who set Booth's broken leg on April 15th. Booth spent approximately 12 hours recuperating before Mudd kicked him out. Mudd was tried with the conspirators and was sentenced to life imprisonment, but he was later pardoned in 1869 by President Andrew Johnson. 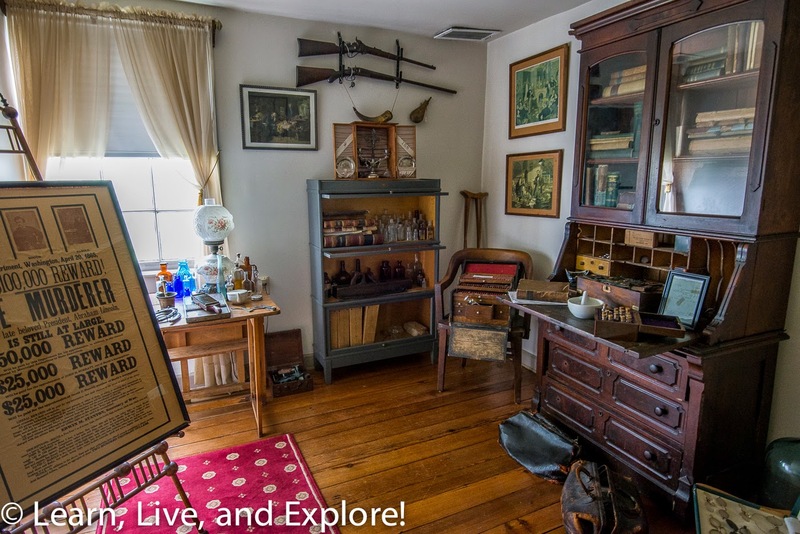 Dr. Mudd's medical kit can be found at the Ford's Theatre Museum. 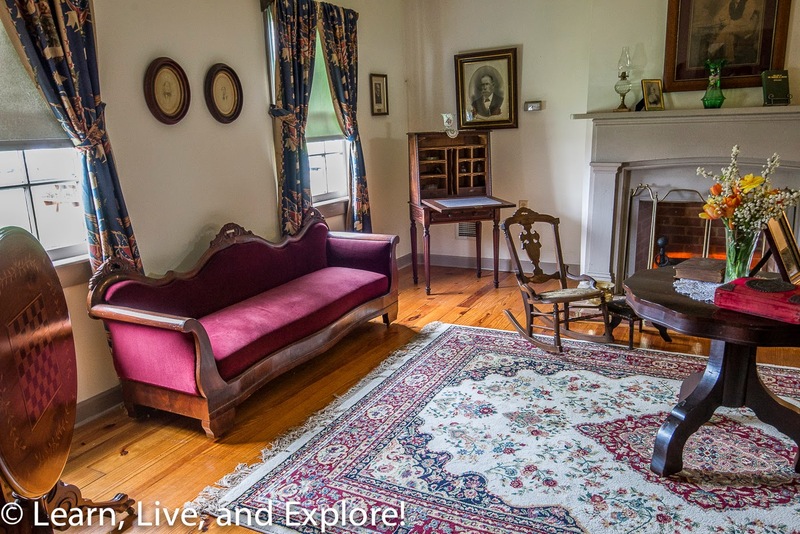 The red sofa in the parlor is the exact sofa where John Wilkes Booth sat and received his preliminary medical examination and treatment prior to being moved upstairs to a bedroom. A great movie on all of the conspirators and the events of April 14 and 15, 1965 is the 2010 movie by Robert Redford, appropriately titled "The Conspirator." I'm sure there's some segment in a Ken Burns' documentary that covers this topic as well. And, of course, there are the 6,800 plus books that can provide additional background if you want to get more information. Additional artifacts exist around the country, and a great blog has the extensive list. It's pretty amazing what people keep as mementoes. 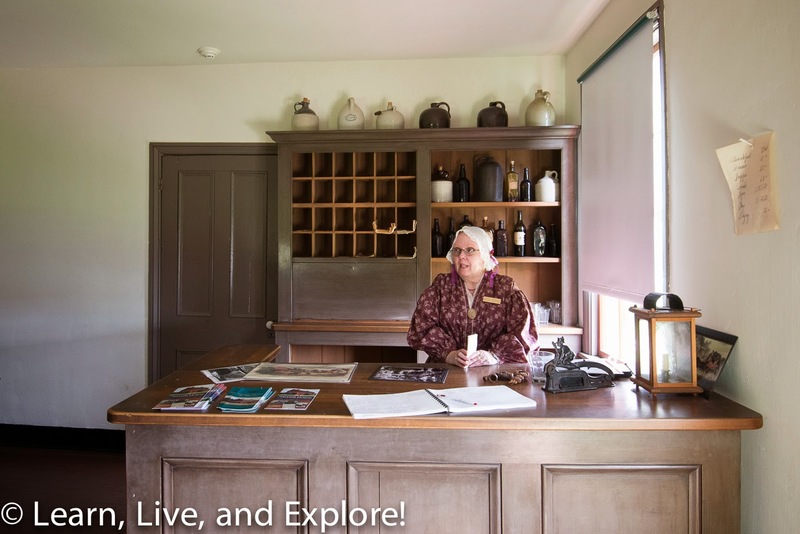 Another website to visit is Abraham Lincoln Online. Booth's escape ended on April 26th, 150 years ago today, when he was found hiding in a barn near Port Royal, Virginia. Federal troops set the barn on fire, causing David Herold to surrender. Booth remained in the burning building until a soldier, Sgt. Boston Corbett, took it upon himself to shoot Booth through a slat in the wood siding. Ironically, the shot entered into the back of Booth's neck. Booth was pulled from the building and died a few hours later from his wound.